These days, public concern about Renovation is growing. This is not only social phenomenon. Renovation become more important role in designing architecture. 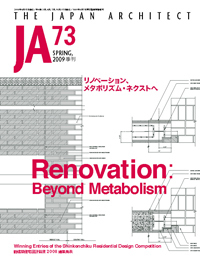 In this issue, we introduce some examples of Renovation and wish to be some kind of motivator to think about Renovation itself.